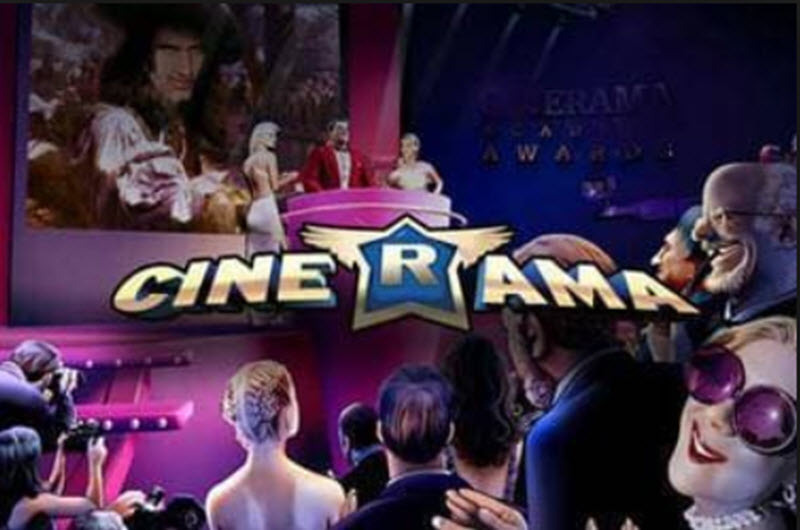 As the name suggests, Playtech’s Cinerama slot is all about the movie world. There are two different bonus rounds: Box Office bonus and Movie Director bonus. 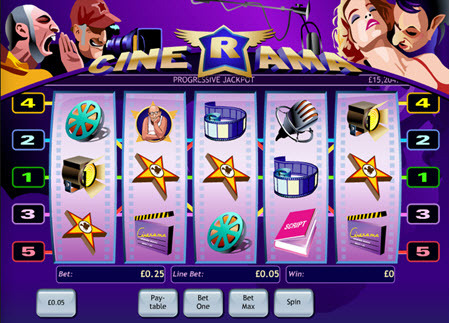 Cinerama also sports a pooled progressive jackpot, fed jointly by players in all the casinos where Cinerama is played. When it pays out, it restarts at $15,000, so there is always something to win even if it has payed out recently. Important: You can only win the progressive jackpot on a 5 coin wager. Cinemara is a fairly old slot, and is shows when it come to the graphics. The theme for Cinerama is movie production. Examples of items that can appear on the reels are film reels, lights, script, clapperboard, megaphone, microphone, and earphones. The movie director is also here. You get to decide how many of the five betlines to activate (i.e. bet on), but you can not bet more than 1 coin per payline and the coin value is fixed at $0.05. This sets Cinemara apart from more modern slots, which tend to offer more flexibility when it comes to the wagering. The film projector is a wild symbol. It can replaced a regular symbol, but not the special symbols Director and Earphones. In addition to being a wild, the film projector is also the key to the fixed and progressive jackpots. Five projectors lining up correctly are required to win a jackpot. You can only win the progressive jackpot on a 5 coin wager. If five projectors line up correctly when you have bet 4 coins or less, you win the fixed jackpot instead (10,000 coins). If you get earphones anywhere on the first reel, the interactive Box Office bonus round will start. This is true even if the earphones are on a non-activated payline. During the Box Office bonus round, you get to select one of four movies. If your selection becomes the most successful one at the box office, you get rewarded. If you get at least three directors, from left to rigth, on an active payline, the interactive Movie Director bonus round will start. You are now the movie director, and your job is to select to actors for the leading roles in your movie. Which ones you select will impact who popular the films gets and how much money you earn. Included in the bonus round is a visit to the in-game Academy Awards, where you will find out who well your movie did.